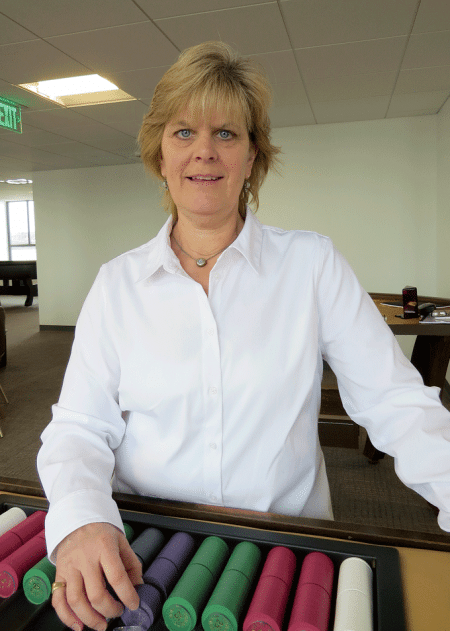 Diane Garvey, frustrated in her search for a sales position, has started down a much different career path, and was one of the first to sign up for classes at MCCTI. Diane Garvey was at a career crossroads. In a big way. In her 50s, she had spent most of her career working at call centers, as an office manager, and mostly in sales positions, specifically in the candy business, supplying retailers with everything from M&Ms to Russell Stover samplings. Her most recent position had been eliminated in a restructuring last August, and she spent the next several months in a decidedly futile search for something else. By late last year, with her unemployment benefits winding down, her stop at the crossroads ended, sort of, and she started down a road previously not available to her and one she probably couldn’t have imagined last July. That would be the Massachusetts Casino Career Training Institute, or MCCTI, an acronym that is quickly working its way into the region’s workforce lexicon and into the vocabulary of people like Garvey. She was on the ninth floor of 95 State St. in downtown Springfield last Monday, taking the first of six weeks of classes that will likely earn her an audition with MGM Springfield, the $950 million casino going up next door, and perhaps a job on the casino floor by early summer, a few months before the sprawling complex is set to open. There are roughly 70 people signed up for the first set of classes at MCCTI, a joint venture of Holyoke Community College and Springfield Technical Community College and part of the schools’ hugely successful TWO (Training and Workforce Options) program, which has created training programs to qualify individuals for work in several fields. For each one of those students, the story is a little different, even though they’ve chosen the same path. Some, like Garvey, are unemployed and looking toward the casino as a place to relaunch their careers. Others are retired or near retirement and looking for something part-time to help fill the day and put a little money in their pocket. Others have some experience working table games in casinos and look upon MGM Springfield as a way to parlay that experience into a job with one of the leading gaming and entertainment companies in the world. Orlando Marrero can check that last box, and as he talked about what brought him to the ninth floor for the evening class of MCCTI, he borrowed an industry term. “I rolled the dice,” Marrero, who has a seasonal job delivering propane, told BusinessWest, not once, but several times as he discussed his decision to relocate to the City of Homes and essentially position himself for a job with MGM Springfield when it opens. Dixon said the casino will need roughly 450 table-games workers and poker dealers when the casino opens, and he admits that MGM has its work cut out for it to not only meet that number but succeed with a much larger goal — sustainability. For this issue and its focus on workforce development, BusinessWest talked with Marrero and Garvey about their decision to enroll in MCCTI, and with Dixon and others about the many challenges involved with having the casino floor fully staffed by opening night. 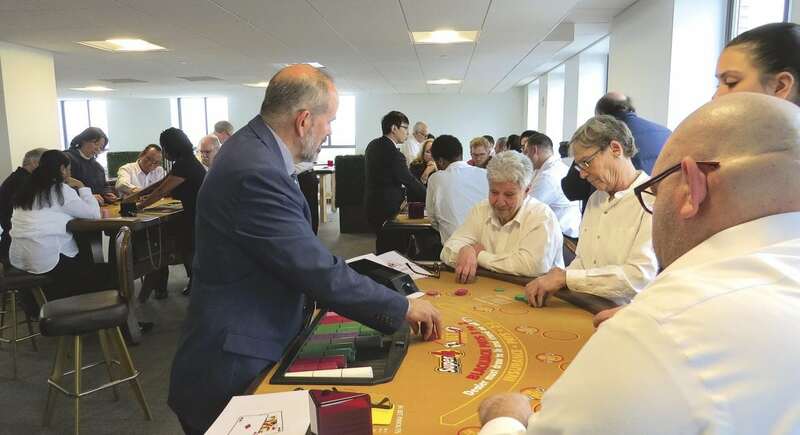 With this pipeline-building test in mind, MGM Springfield has taken a number of steps designed to generate interest in the school and prompt more people across that broad spectrum described above to consider careers in table games. An instructor works with students of all ages on the first day of classes at MCCTI. These include options when it comes to how many games one wishes to learn, flexibility in the scheduling of classes (they run morning, afternoon, and night); similar flexibility when it comes to hours of employment (there are full- and part-time jobs and several shifts); and even reimbursement of the tuition cost. Still, with all those incentives and flexibility, creating a large, talented corps of table-games workers in an area new to the casino industry will be a daunting challenge, said Dixon. But he’s hoping, and expecting, that some of the first students to enter the pipeline — people like Garvey and Marrero — will become effective spokespeople, if you will, and help in the recruiting effort. This is exactly what happened at MGM’s property in Maryland, National Harbor, which opened just over a year ago. There, a school similar to MCCTI and operated in conjunction with Prince George’s (County) Community College, was instrumental in helping that facility staff up with table-games workers. Marrero hasn’t even been hired yet, and he’s already helping in this regard, with comments like these when asked about why he was looking forward to returning to the casino floor — sometime soon, he hopes. Marrero was a dealer for several years at Mohegan Sun and Foxwoods. He relocated to Western Mass. so his wife could take a job here, and he has taken odd things (like delivering propane) since. He first contacted Holyoke Community College with inquiries about a dealer school about three years ago, and was one of the first to sign up for the initial cohort of classes. Overall, Marrero fits just one of many profiles that TWO administrators are seeing in the group signed up for the first cohort that started on Feb. 26, said Jeff Hayden, vice president of Business and Community Services at Holyoke Community College. He told BusinessWest that students come in all age groups and with a host of different backgrounds. Some signed up looking for a new career; others arrived on the ninth floor at 95 State St. hoping to find something new, different, and fulfilling to do in their retirement. 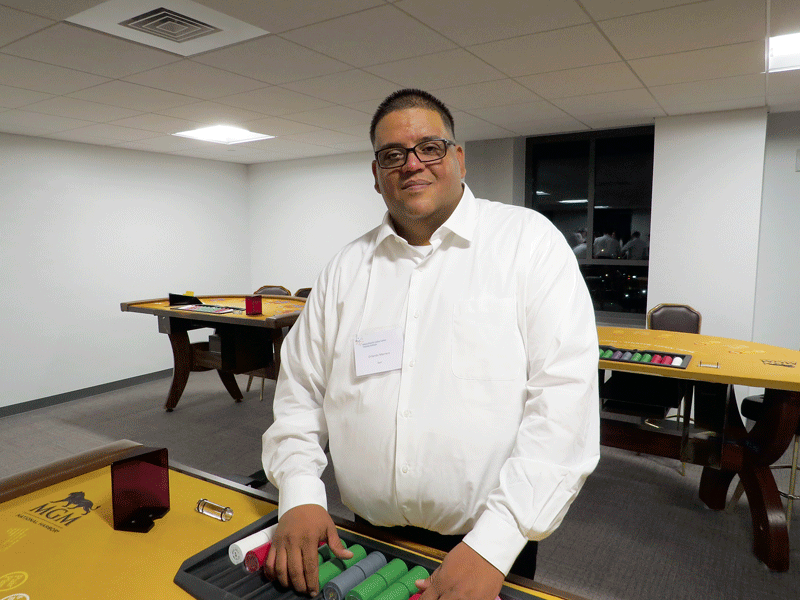 Orlando Marrero is an experienced dealer who enrolled at MCCTI to refresh his skills and learn more games. “So far, we’ve had a good response, but we’re always looking for more people,” said Hayden. “We’re seeing a mix that reflects the region; we’ve had a significant number of people who have some experience and are looking for a refresher course, or they know two games and want to know four games. Dixon told BusinessWest that widely diverse student bodies are typical at these so-called ‘dealer schools,’ which exist even in areas, like Las Vegas and Atlantic City, where the gaming industry has a huge presence. That’s because table-games workers will often seek to add to their skills by mastering new games or by refreshing themselves on ones they already know, perhaps with the goal of winning a supervisory position. In markets like Greater Springfield, however, a larger number of students are being introduced to these games — and to careers in gaming. Hayden said that students essentially sign on for a 10-week block of classes. The first six weeks are spent on a so-called ‘level 1’ class in either blackjack, roulette, craps, or poker. 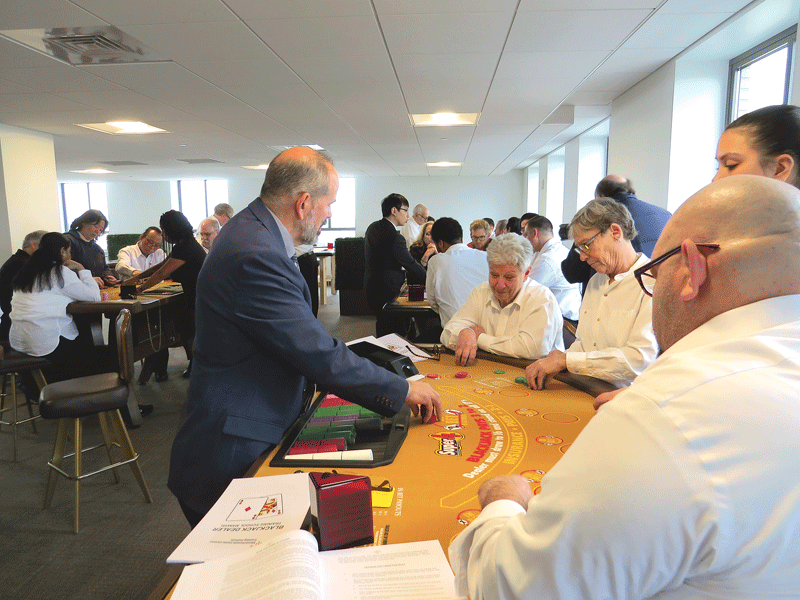 A student would then take a four-week ‘level-2’ class in everything from mini baccarat to pai gow poker to follow-up sessions in blackjack, roulette, and craps. Successfully completing classes for two or more games guarantees the student an audition with MGM, said Hayden, adding that, if a student were so inclined, they could sign up for two 10-week blocks and learn three or four games, thus likely improving their odds for employment and perhaps advancement. Those auditions could come as early as mid-spring, said Dixon, noting that MGM Springfield will begin hiring experienced table-games workers in April and early May, and will likely start the hiring process with the first MCCTI graduates around that same time, meaning they could be on the payroll by June. With that timetable, Diane Garvey will likely need an extension of her unemployment benefits to get by — something individuals can apply for and something that is often granted to those enrolled in training programs like MCCTI. She told BusinessWest that she didn’t come to her decision to enroll in these classes quickly or easily. Instead, after much consideration, she decided that this seemed like the most logical path to take from the crossroads she arrived at, and maybe the best fit. They see MGM and a job on the casino floor as a chance to add a missing piece — whether that piece is a career that’s not at a dead end or a part-time position that can add an intriguing wrinkle to retirement. In both cases and a host of others that fall somewhere in between, it’s an opportunity. And to seize that opportunity, many are doing just what Orlando Marrero decided he had to do.